Are you looking for something to do with the family for Easter this weekend? Here are some Easter-related events submitted to us by our members! Decorating cookies is a great way to celebrate the Easter season! You’ll learn the “secrets” of piping & flooding, along with tips to make the decorating process a snap. Register at sugardoodles.org/classes or by calling Toots, 618-277-7373. Breakfast with the Bunny from 8am-11am for a hearty country meal to start this fun-filled day. Family-style breakfast includes scrambled eggs, hash brown, bacon, sausage, biscuits & gravy, plus a buffet of cereals, fruit and fried biscuits. Drink of coffee, juice, tea, milk or soda is included. $6.99/child and $12.99/adult. To make a reservation, please call (618)233-0513 x 3. Hop on down the bunny trail and fill your basket with fun! Eckert’s Annual Egg Hunt, baby chicks & bunnies, face painting, the Easter Bunny, plant a seed and savor a yummy Easter treat. ,A photo with the bunny can be purchased for $10 each. Easter Egg Hunts, the largest in Southwestern Illinois, will take place at 9 am, 10 am, 11 am, 12 pm, 1 pm, 2 pm and 3 pm. 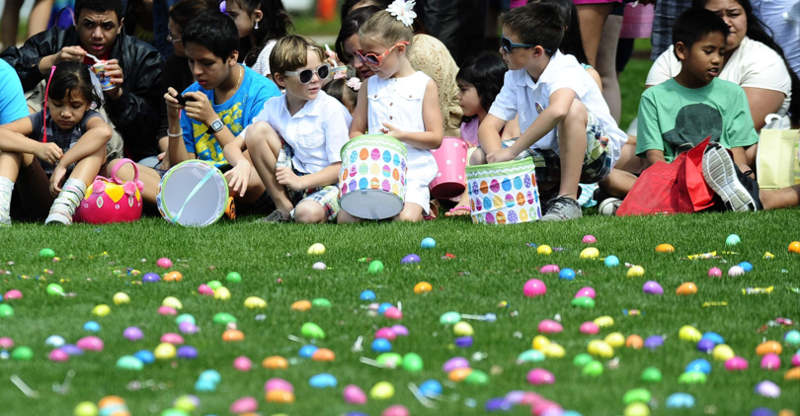 Event includes breakfast, egg hunts, games, and a visit from the Easter Bunny. Everyone is welcome! Easter morning will be filled with excitement as we worship together at St. Paul United Church of Christ. All are welcome! This lavish Buffet will consist of breakfast, lunch and dinner items including but not limited to; Traditional Eggs Benedict, Omelets Made to Order, Biscuits and Gravy, an Ice Bar with Oysters on the 1/2 Shell, Jumbo Shrimp Cocktail, Carved Prime Rib & Turkey, Assorted Desserts and much more! Reservations are required on this holiday, call 618-206-6451 to book yours today! $29.95 Adults, 12 + under $16.95, under 4 Free! Admission is free, however, a brunch purchase is required for kids entering the egg hunts.